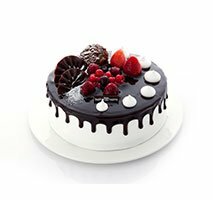 These are cakes in a variety of shapes and sizes put together by our expert chefs! Indulge in a perfect combination of ice cream flavors topped with exotic seasonings! A slice of paradise for your next occasion. 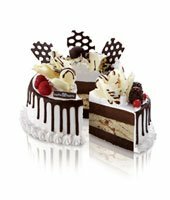 This round ice cream cake is a perfect pairing of Pralines ‘n Cream and Chocolate ice creams surrounded by indulgent chocolate fudge drizzles. 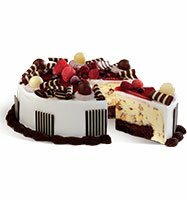 This cake is adorned with white and milk chocolate truffles and curls, decorative chocolate lattice and blackberry, raspberry and red currant fruits for a decadent finish. An adored combination of chocolates make up this ice cream cake. Our world favourite chocolate chip wrapped in smooth milk chocolate with a chocolate cake base. 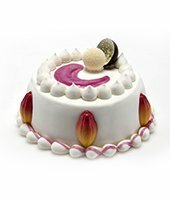 It is beautifully decorated with lovely chocolate ice cream swirls and blueberry, cherry & red currant fruits. The chocolate heart cookies and white and milk chocolate pinwheels top it off for the ultimate lovely treat. 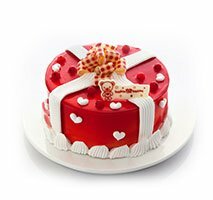 The Sweet Gift Box ice cream cake is a generous serving of Very Berry Strawberry ice cream, Blue Berry Cheesecake ice cream, and scrumptious vanilla sponge cake. Gifts don’t come sweeter than this. Made from generous scoops of Hokey Pokey ice cream, a scrumptious layer of vanilla cake, and completed with delicious whipped cream and icing, just like its name suggests, the Hokey Pokey ice cream cake is everything you need to get a fun-filled celebration started. Vanilla ice cream, caramel ribbon, chocolate cookies and a luscious chocolate sponge cake, all elegantly wrapped as one delectable dessert. That’s what you get with the lip-smacking Rich Golden Gift ice cream cake. Let the celebrations begin. 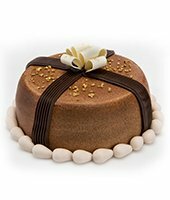 Devour the irresistible taste of our trademark Chocolate Mousse Royale ice cream, wrapped in rich chocolate sponge cake, and completed mouth-watering toppings. 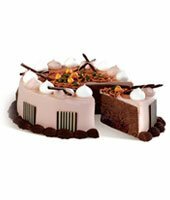 The Royale Chocolate ice cream cake is a dessert fit for royalty. 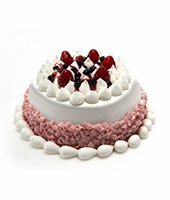 The Strawberry Delight ice cream cake is a delightful serving of yummy vanilla sponge cake layered with Very Berry Strawberry ice cream. It’s guaranteed to add that extra bit of happiness to just about any occasion. 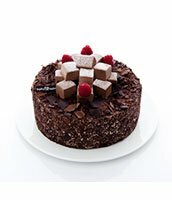 Made from World Class Chocolate ice cream and savoring chocolate sponge cake, the Chocolate Mini-bites ice cream cake packs an enormous punch of chocolate goodness, that’ll keep you wanting one more slice, again and again. 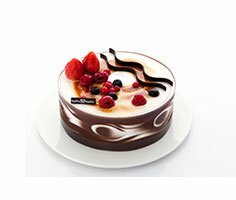 Garnished with glazed berries and chocolate swirls, the Praline Swirl ice cream cake combines your favorite Pralines ’n Cream ice cream with tantalizing chocolate sponge cake, to deliver an unexplainable, indescribable taste of yumminess. From its delicious milk chocolate ribbon & chocolate coated almonds, to its luscious vanilla ice cream, everything about the Almond Bon Bon ice cream cake invites you to do just one thing: Indulge. Simply dazzling! 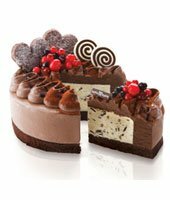 A round Ice Cream Cake made with velvety Pralines n’ Cream ice cream and rich chocolate cake gives way to a chocolate fudge scroll, lined with creamy pieces of luscious chocolate. Perfected with striking chocolate rosettes, decadent white and milk chocolate truffles and whipped cream. Garnished with a colorful display of strawberry spread and adorned with strawberries, raspberries and blueberries for an elegant finish. 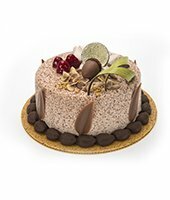 A captivating round Ice Cream Cake layered with premium chocolate ice cream, indulgent chocolate cake, adorned with chocolate and whipped cream rosettes and fine European chocolate pieces. Generously finished with chocolate frosted topping, pistachios, praline hazelnuts and chocolate straws, and drizzled with a caramel ribbon. It is the ultimate rich and creamy chocolate indulgence. Official Ice Cream of Liverpool Football Club. Copyright © 2011 BR IP Holder LLC. All rights reserved.